If you are thinking about buying a barbecue grill, the first thing that you need to consider is what type of grill you would like to buy. One option is to simply buy a disposable grill whenever you need one. The main advantages of a disposable grill are firstly that it is highly portable (you can easily take it on a picnic or camping, assuming of course that barbecues are allowed at the location in question), and secondly that disposable grills are easy to clean up (you simply throw the whole thing away when you are finished - after it has cooled of course). 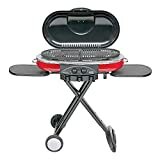 Additionally, disposable grills are very cheap, and if you are only barbecue occasionally, can therefore be more economical than buying a reusable grill. Charcoal grills are often the cheapest of reusable barbecue grills. 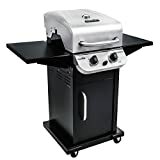 There are a variety of types including simple braziers, hibachi grills (which are a step up from braziers), and the classic American-style, kettle grill. It can some skill to master cooking on a charcoal grill, and you must of course clean up the ashes after use, but many barbecuers say that they do prefer the taste of food cooked on these grills. Gas grills are the easiest type of barbecue grills to work with. The amount heat can be easily controlled by turning a knob, and many models even include a thermometer. Additionally, these grills are easy to clean, and therefore popular with both domestic and professional users. Electric grills are relatively new, but they are of course different from cooking over a gas or charcoal fire. 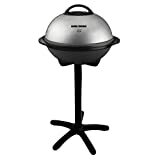 They are for example some models in the range of George Foreman Grills which are be suitable for outdoor use. George Foreman GG50B 15-Serving Indoor/Outdoor Electric Grill, Silver. Problem grill does not turn on, possible cause grill is not plugged in, solution Check to be sure appliance is plugged into working outlet and On/Off switch in the ON position. Get great grilled flavor every day from this compact, high-performance grill. It's small format can be put almost anywhere for ultimate convenience. 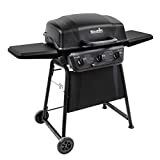 And although the grill is compact, its ample cooking grate is large enough to cook most family meals - 8 steaks, 8 hamburgers, 6 - 10 chicken breasts, or over 4-Pound of fish. The grill heats up very quickly, and uses far less gas than a full-sized grill. Best of all, with its great portability features this grill can cook your meals wherever you go - the beach, the game, the campsite - anywhere. Folding legs, grill lid latch, generous carry handle, and the spill resistant drip tray all enhance portability. Innovative culinary tools are the Cuisinart signature. The prestigious Cuisinart brand is not limited to their famous food processors - plugged or unplugged, nobody covers the modern chef like Cuisinart. Cuisinart is a full-service culinary resource with a wide array of products, preferred by chefs and favored by consumers. And now you can take the world famous Cuisinart brand to your patio, lawn, tailgate, or campsite with their comprehensive line of Cuisinart outdoor grilling products available now on Amazon.